The new Hutto, Texas, City Hall will recycle a former cotton gin and grain silos in a green design that will accommodate community needs in a fast-growing city. 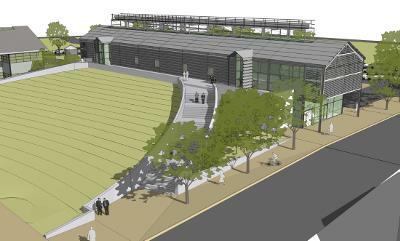 Antenora Architects LLP is designing the new government center that features adaptive reuse of agricultural structures. Earlier the Austin-based architecture, planning and interior design firm led the planning for the Hutto Co-op District. The plan for this 18-acre complex includes a new city hall, a public park with amphitheater and a multi-use building. When the $7 million project is complete next year, citizens will enjoy a modern, eclectic city hall. Grain silos will be converted into the council chambers, a new park will appear, and a sustainable power cogeneration plant will lower energy costs. One of the town's most famous landmarks, a long horizontal metal silo locally known as "The Long Building," will be reused to a large extent as a temporary city hall and flexible space. A community design process called a charrette allowed the community to gather ideas from citizens, city staff, city council and local businesses. The community didn't want to lose its roots as an agricultural community. Keeping a reminder of the cotton gins and grain silos was important to the original residents. Hutto's rapid population growth led to the desire for a new civic building. The city's population grew from 1,250 in 2000 to an estimated population 17,120 in 2010. The project will include a cogeneration power plant that will generate an efficient combination of electricity, steam and chilled water at the same time. Editors' Comment: We love this adaptive reuse. It's striking our readers as very creative. Many smaller rural towns in agricultural areas have grain elevators that are no longer in use. What to do with them has been one of the peskier small town issues. One of the interesting lessons here is that innovative energy conservation isn't just for the big city. The co-generation plan sounds very interesting. The moral of the story might be that if you want to re-use a building or complex of buildings, find yourself a good architect. Some of the townspeople may be able to make an antique mall out of a group of storefronts, but this is way more complex. This project also illustrates an asset-based community development approach as well. Join in and write your own page! It's easy to do. How? Simply click here to return to community improvement projects.